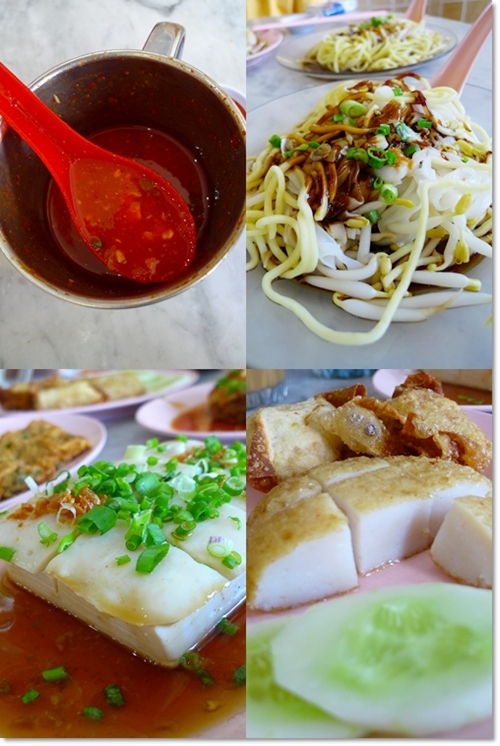 Nam Fatt Fish Ball Noodle House Restaurant has been gracing the Ipoh’s street food scene for a respectable period of 24 years. 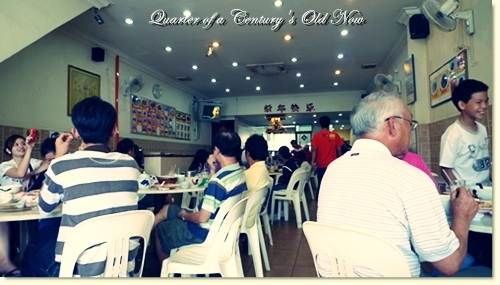 Almost a quarter of a century’s old, which has since seen their transformation from a simple fish ball noodle stall to a fully air-conditioned restaurant, while still maintaining the quality of their food. 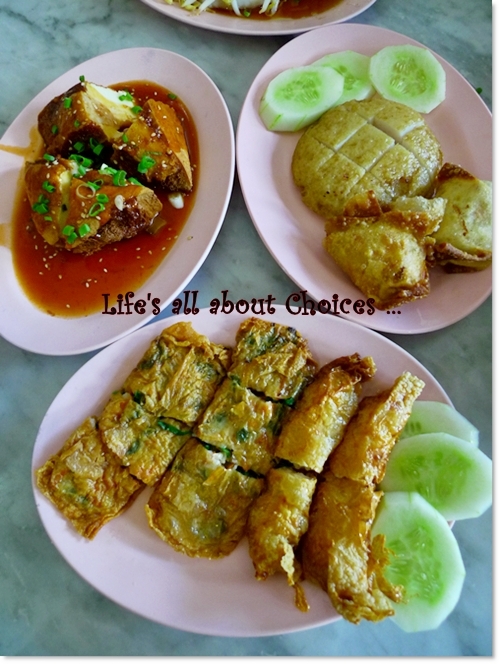 But of course, don’t go comparing the prices to the usual hawker fares, most notably the famous Big Tree Foot (Dai Shu Geok)‘s Fried Liew (aka Stuffed fish paste) which is ironically, a stone’s throw away. But the extensive menu with clear shots of the food, ranging from noodles and rice with beef stews, claypot beef soup, an astonishing array of Yong Tau Foo, or as we used to call them, Yong Liew, and even curry noodles with roast pork, noodles with grouper slices, and so forth. Trust me, if you’re eating here alone or with just another companion, gluttony and greed might just strike and you’d end up with extra servings to be taken away (‘tapau‘). Really. For we ourselves fell for their trickery, and ended up with more than we could finished off !!! The moment we stepped into the restaurant, a wave of nostalgia set in. After all, this was the same shop on Jalan Kampar (now Jalan Raja Permaisuri Bainun) that we have been eating in since we were small. Yes, when there was no Old Town White Coffee outlets, no salted egg yolk crabs, no Mongolian chicken chop in Chinese ‘chu char’ restaurants, and certainly no wifi facilities in cafes, let alone coffee shops. And yes, while we’re on the subject of Wifi services, Nam Fatt does offer free Wifi to their much-appreciated diners, so you can indulge in your daily doses of geekery, while chewing on their crispy pieces of Sar Kok Liew (stuffed turnip). A deadly combination you say? Wait until you sample the rest of their signatures. And there are aplenty!!! 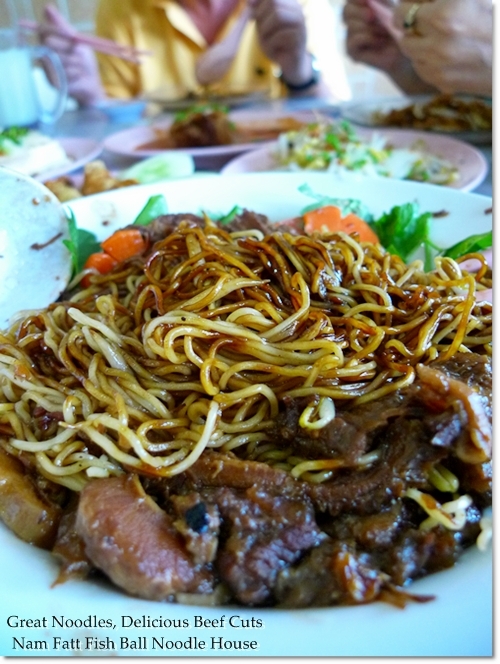 The Stewed Beef Noodles (RM7.00/USD2) is a complete meal on its own, with generous portion of tender beef cuts marinated and stewed with lots of garlic cloves. The intense flavour of the beef was astounding, paired off perfectly with the noodle of your choice. I picked their springy egg noodles, and came away really satisfied, but pretty full from the noodles itself. If you intend to sample quite a variety of their YTF (Yong Tau Foo), you’d be better off ordering a simple noodle with no toppings instead. Another one of their signatures, the Teochew Taufu with West Gravy (ridiculous name?) (RM3.20/USD0.90 for 2 pieces) was hands down MY personal favourite stuffed items ordered that afternoon. 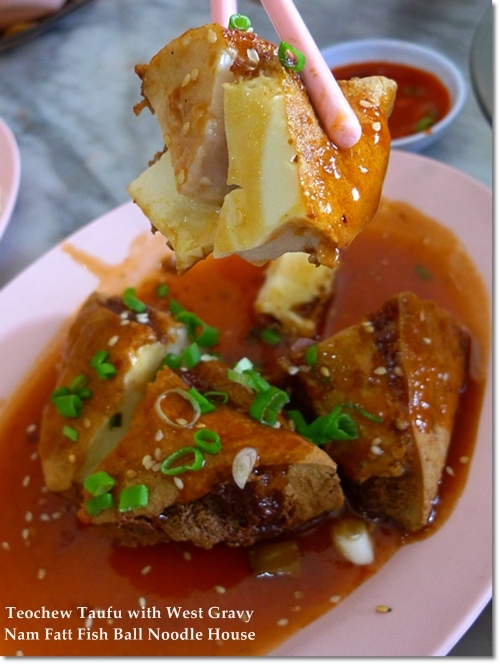 The crispy exterior of the smooth stuffed beancurd stood out, albeit being drenched with their proprietary ‘West Gravy’, a tangy concoction of chili and tomato sauce, with a dash of oyster sauce, and sprinkling of sesame seeds. An ingenious combination, resembling the usual “Tim Cheong Lat Jiu” (sweet sauce and chili sauce) commonly served with Chee Cheong Fun. Not to say their steamed items are not good. In fact, that is far from the truth. 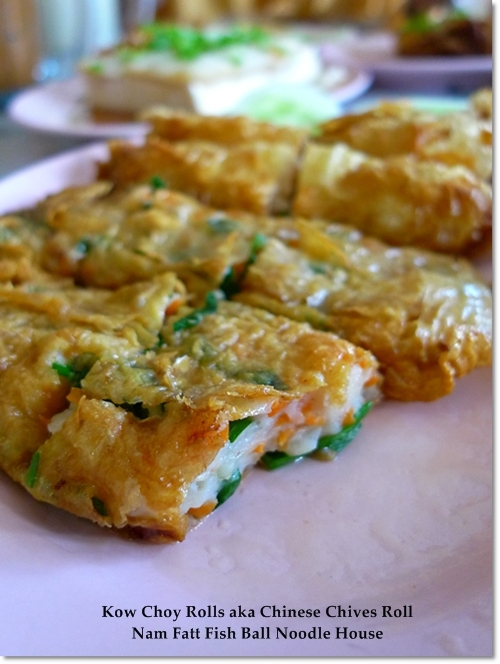 The simple Fish Paste & Tauge (bean sprouts) combination sounds simple on paper, but screamed HOMECOOKED! The fish paste is of course, Nam Fatt’s killer recipe (my guess is that bouncy, fresh and sweet wolf-herring fish aka “saito” fish being used, but don’t quote me!) and stood out amongst the seas of fish ball-wannabes everywhere else. Without the faintest hint of unpleasant, artificial fishiness, nor reeking of chemicals being used (boric acid and its salts come to mind). We were tempted to order a plate of their roast pork to be shared, as well as a whole lot more of their 24 varieties of YTF. But seriously, who were we kidding? Stuffed to the brim, we ended up taking away some of the Liew; the enjoyment to continue back at home. The restaurant was packed throughout our lunch session. Many patrons were evidently out-of-towners coming back for the Qing Ming festival, but there were quite a handful of locals as well. The restaurant was comfortable and rather spacious, though I highly doubt the place can seats a much larger capacity crowd, for we saw extended families separated into different tables while we were there. Just minor gripes, I’m sure. For when your bowl of curry noodles, or claypot beef soup with rice is served, instantaneously you’d feel right at home; Digging in with relish, without a care of your surroundings. Business hours : Daily from 7.45 am until 10.45 pm. No off-days. Closed only the first day of Chinese New Year. 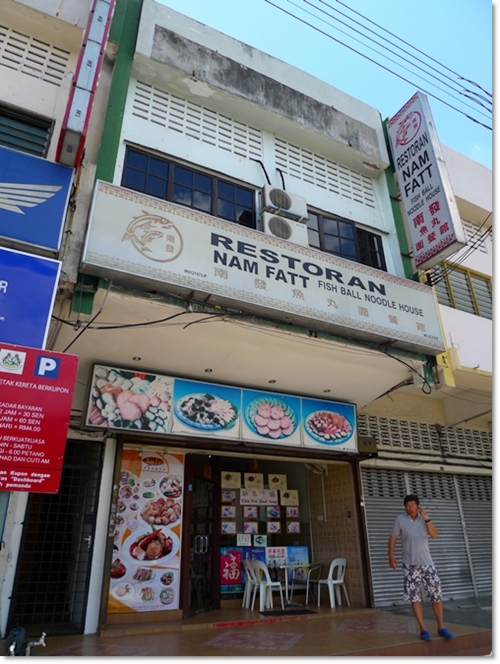 Here’s a GOOGLE MAP to Nam Fatt Fish Ball Noodle House. You can also read CK Lam’s review, or WorldWindows’ pigging out for a clearer view. Being there many times. You’ll be spoilt for choice. But the price……ouch! A little ouch, indeed. But then again, once in awhile oklah. 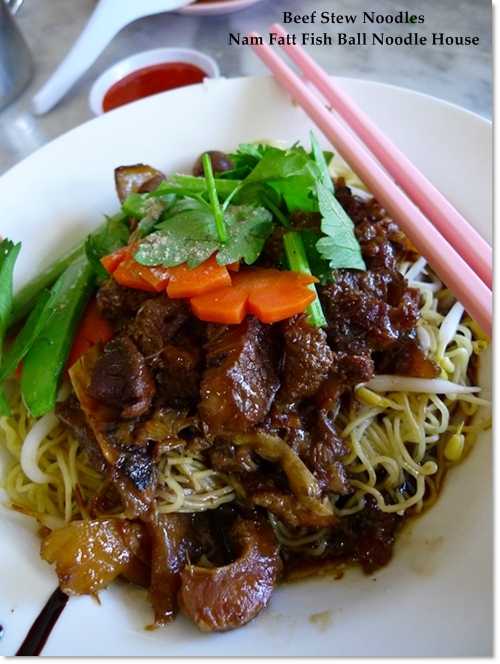 Curry noodles with roast pork at only RM4.50 ma …. Ahh yes, I love the food here, albeit a bit more expensive! I just adore YTF and all the variants! Had wanted to eat there last weekend but then mom wanted vegetarian food, so… next time lah! Yeah, slightly pricey but then oklah … air-cond and homemade, quality ingredients. like the chive and fish paste roll. heard about this place, in fact, visited before… but had a very bad experience. Erm, but come festivities, from CNy to Qing Ming, you;d be surprised at the immense traffic Ipoh can get! From the color of the fish ball, it already tell us it is a good one. True also loh. We regretted once seeing the portion of our noodles. But the stewed beef noodles was really good. 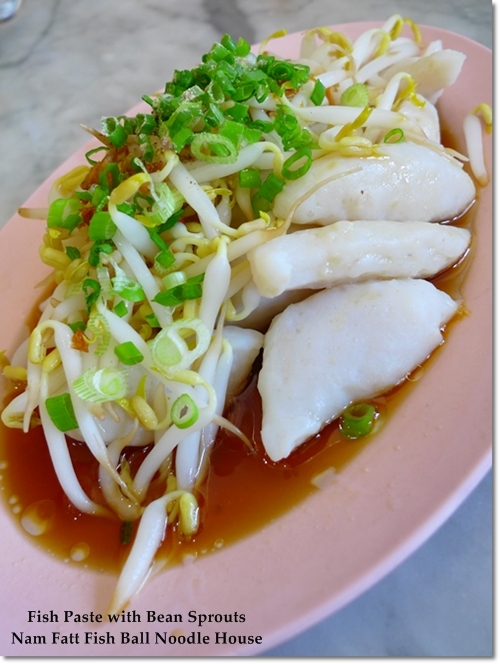 Hi J2Kfm, you mentioned “the Teochew Taufu with West Gravy (ridiculous name?)”. Just for your info – Cantonese chef like to refer ketchup as western sauce or western gravy. Unbelievable, Unbelievable, Unbelievable, Unbelievable, Unbelievable, Unbelievable, Unbelievable!!!! so good I live in Canada and I long for noodle/fishball everyday, EVERYDAY!!!!!! Your blog keeps getting better and better! IÕve been following your articles for a few weeks now and I gotta say that your older posts donÕt offer as much insight as the newer ones. Your writing is constantly improving! By the way, if youÕre looking into placing some adverts on your site Ð you should really do it. Excellent write-up and interesting report. I finally got the place for stewed beef tripe and things beef. Thank you. You made my day! Be rushing there tomorrow.